to support the balance of the energetic body. It comprises a quasi crystalline water structure, which develops throughout an extensive maturing process. The vibrational patterns stored during this process give Nova Vitalis Original Crystal Water its unique properties. as the raw substance to create Nova Vitalis Original Crytsal Water. The spring is situated 1000 metres above sea level in the natural conservation area Haut Languedoc (Tarn, France). The water is pure and untreated at the source and delivered directly to Nova Vitalis. the spring water lends itself well to harnessing and storing the most diverse information. The dipole structure allows the water molecules to arrange themselves into geometric structures retaining information and vibrational energy which it can then transport to other cells within the living organism. Scientists have associated this phenomenon with the simple reference ‘water has a memory’. 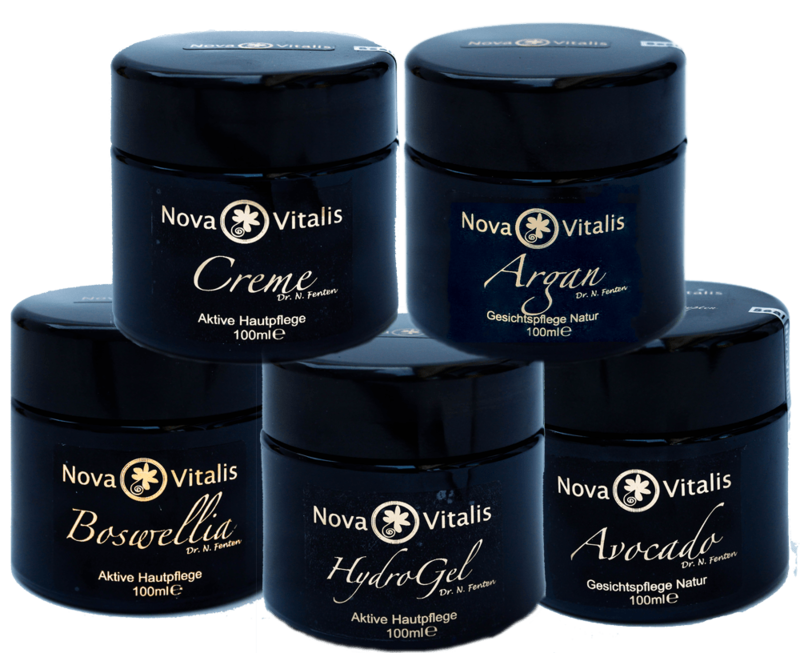 including creams and a HydroGel encapsulating the properties of Hemp and Boswelia combined with the vibrational potentional of Nova Vitalis Original Crystal Water. enables a water saturation of over 80%. Used as a binding agent, its water-like consistency combined with the high content of Nova Vitalis Orginal Crystal Water neither blocks pores nor damages the skin, but ensures that as much Nova Vitalis Crystal Water as possible remains in the skin by minimising the skin’s surface moisture loss. In addition to the basic cosmetic range, Dr Fenten has created a range containing the highest quality Argan, Avocado and Rose oils. Good health is a strong gut feeling! The Nova Vitalis digestive supplements Vanillefit (Vanilla), Schockofit (Chocolate), and Elexier (Elixir) comprise long-chained macromolecules charged with vibrational patterns which support the metabolic absorption potential of the intestines as well as encouraging healthy intestinal peristalsis. As well as serving to process and absorb nutrition from our nutritional intake, the intestines are vital to stimulating and activating our immune systems, fighting against toxic effects of artificial food additives and external factors such as direct contact with toxins and disease- inducing pathogens, viruses, bacteria, fungus and parasites. Healthy intestinal flora create a microbial barrier against pathogens, stimulate instestinal peristalsis and encourage the production of vitamins. We stay healthy in spite of regular contact with environmental germs. working to support a healthy functioning intestinal tract sustain a healthy and strong immune system as long as there is no energy deficiency to weaken and burden the digestive system. Lebensmittel und Nahrungsergänzungsmittel dienen nicht der Behandlung von Krankheiten. Diesem Zweck dienen ausschließlich nach dem Medizinproduktegesetz (MPG) oder dem Arzneimittelgesetz (AMG) in Deutschland zugelassene Produkte. Aus diesem Grund dürfen wir keine Empfehlungen zur Behandlung von Krankheiten mit Nahrungsergänzungsmitteln oder Lebensmitteln aussprechen. Auch die Nennung von Beschwerdebildern oder Erkrankungen, die durch die Einnahme von Nahrungsergänzungsmitteln oder Lebensmitteln positiv beeinflusst werden können, ist verboten.